You've put a few more miles in, but perhaps you haven't gotten to your destination yet. You need some quick relief before you head back into the car. Twists are a great quick relief for your back, your spine, your belly, and your neck. 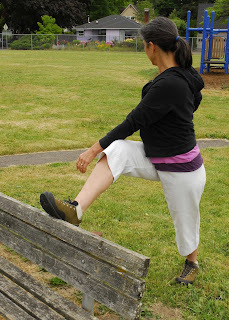 Stand facing the back of a bench and take a wide stride with right foot back. Your left foot will face the bench and your right foot will be slightly turned out. 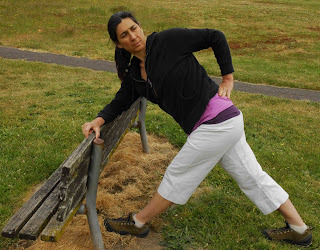 Place your left hand on your left hip and reach for the back of the bench with your right forearm. Engage your deep abdominal muscles and lift your pelvic floor muscles as you slowly revolve your spine to the left, over the front leg. Keep your upper chest broad and don't over twist your neck. If it feels good you can gently turn your head left and right as you remain in the pose. Hold the position for 3 to 10 breaths and repeat on both sides two or three times. Stand behind the bench about two or three feet and lift your right foot up onto the bench back. Your lifted knee is bent to hip height, or higher. Your standing knees is soft and open, not locked. 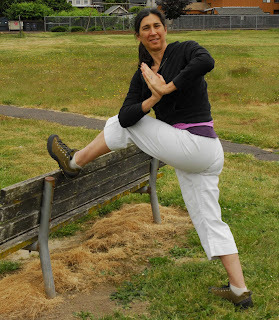 Take your right hand to your right hip and your left forearm across to the outside of the lifted right knee. Gently press the right forearm into the outer knee as you revolve your chest to the right over the lifted leg. You can use as much strength as feels appropriate in the arm to bring the twist up into your rib cage. Feel how your breath opens up the ribs and the upper spine and allows you to deepen the twist with each inhalation. As above, keep your neck mobile and easy and your core muscles gently engaged. Repeat the twist on both sides, as many times as you like. You can hold the twist for a few breaths or slowly move into and out of the twist with the flow of your breath. If you feel ready for a little deeper twist, hook your opposite elbow onto the lifted knee. The work of the upper arm pressing into the lifted knee will allow you to deepen the stretch in both the lower back and in the ribs and upper spine. Keep broadening your chest as you twist. You can brings your hands together into Anjali Mudra (prayer hands) and turn your sternum toward your thumbs. If lifting the leg to the bench back feels too high, you can do these same twists with the lifted leg on the seat of the bench instead.